Thoughts about stuff that matters to me. Life, humanity, purposeful work, leadership, user-driven products. I gave a talk about organisational change responsibility at Agile Islands 2018. Here are the slides. I have seen managers struggling with self-organisation, to the point of hesitating to lead, because “it would not be self-organising”. As much as I hope for a replacement to prevailing tayloristic / Theory X management, this goes too far and is throwing the baby out with the bathwater. I gave a talk about Christopher Avery's Responsibility Process today in Agile Finland's Helsinki Coaching Circle. A nifty depiction of a design process is the double diamond. I have found it useful for clarifying the intent of product development activities, and the purpose of various design tools. The process was originally developed in 2005 by The Design Council in UK (sources one and two), but many design companies have their own version of it (examples one, two, three, and four). 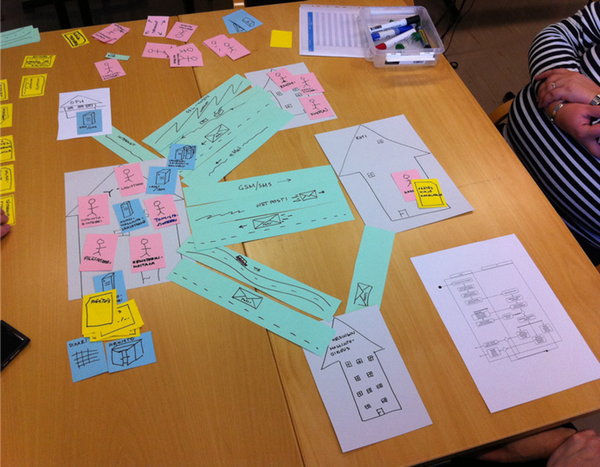 Last year I designed a simple design game for co-designing business processes and/or use cases. Since it has been used commercially in at least two companies, I decided to publish it under Creative Commons just to avoid any confusion with copyrights. The other week I was discussing the all-too-common difficulty of selling user experience design to executives and bigger companies in general. Startups seem to get the importance of user experience, and certainly companies whose customers are consumers. But why is this so difficult for big companies who are in B2B biz? A management speak qualifier that removes the demand to be fact-based, coherent and cosmologically feasible from the following presentation, concept or idea. Warning flag for implementors and other people connected to the real world, such as engineers and customer service personnel.